Contamination in the hydraulic system can cause an endless slew of problems to occur. 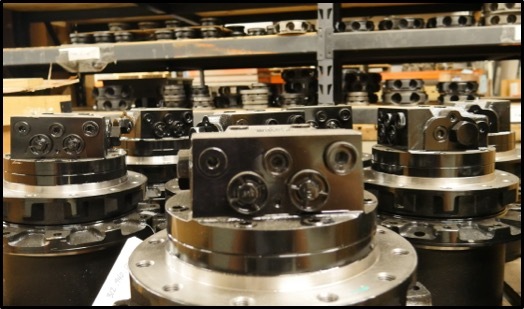 This is especially true of radial piston hydraulic motors, where even a small amount of contamination can damage the cam ring and eventually lead to catastrophic failure. Be careful when adding hydraulic fluid to any part of your system, including your final drive. Try to do your work in a reasonably clean environment, and be careful to keep hydraulic fittings away from dirt and grime. Always follow the manufacturer's recommendation for when you should check and/or change your gear oil. Gear oil is necessary for reducing friction, protecting metal surfaces that come into contact with each other, and carrying away heat that could compromise the performance of the parts. 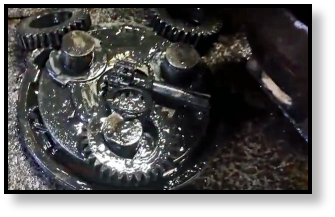 When left too long between changes, gear oil begins to degrade and form a thick sludge that does more damage than good. Think of this type of lubrication as an investment in the life of your final drive -- and the life of your machine, too! We dwell on this quite a bit here at Texas Final Drive, because we have seen over and over again the catastrophic damage that can result from a clogged case drain filter. If your machine doesn't have a case drain filter, that's one less thing to worry about. If it does have a case drain filter, you need to check it periodically to prevent it from causing an increase in pressure than can lead to devastating problems. Another major factor in ensuring a long life for your final drive motor involves paying attention to leaks. Not only do leaks allow important fluids to get out, but they also allow damaging contaminants to make their way in. Don't ignore leaks. Get that final drive examined and the seals replaced as soon as possible after your find a leak. It may involve some downtime for the machine, but it can save you hundreds of dollars in repairs. Some of this may seem like common sense to you, but the fact that we do good business in repairing and re-manufacturing final drives shows that not enough equipment owners are as careful as they should be about final drive maintenance. If you want to maximize the life of your final drive, you should minimize contamination, check and change the gear oil, keep the case drain filter clean, and not ignore leaks.